The government of Malawi has reacted to the criticisms made by Bishop Mtumbuka of Karonga Diocese on the education sector, accusing the Ministry of Education of doing little to assist schools under the Catholic Church in the country. Speaking during golden jubilee celebrations of Ludzi Girls Secondary School in Mchinji district on Saturday, Bishop of the Karonga Diocese, Martin Mtumbuka, said government has failed on its role of providing equal and quality education to all as evidenced in newly removal of tuition fees in government. Mtumbuka said the exercise could have been beneficial if all schools were included as Christian schools have learners selected therein by the government. “It does not mean if government help such schools, the nuns and reverend fathers will be misusing the resources but rather it will go a long way in meeting the desired needs of learners at all level in the country,” Mtumbuka said. 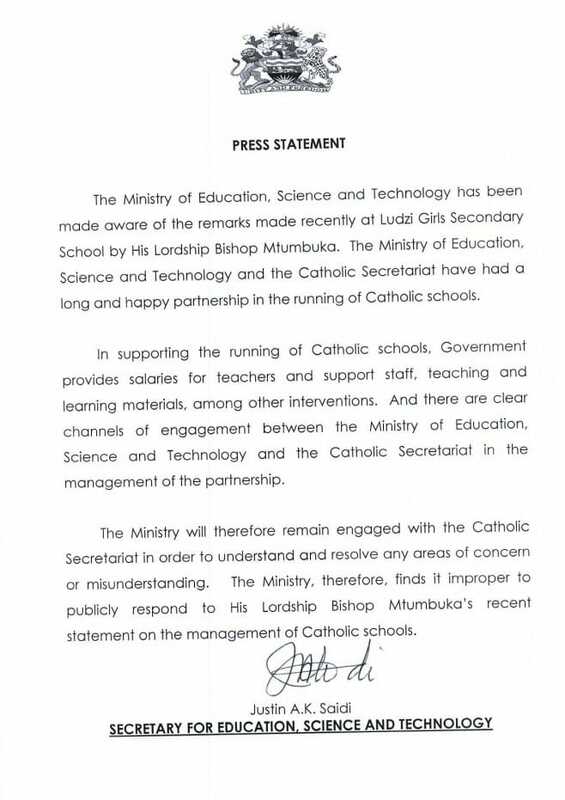 Reacting to Mtumbuka’s remarks, Ministry of Education Science and Technology has quashed the accusations, saying apart from paying salaries to teachers and support staff, government also provides learning materials to Catholic schools. “There are clear channels of engagement between the Ministry of Education Science and Technology and the Catholic Secretariat in the management of partnership. “The Ministry will therefore remain engage with the Catholic Secretariat in order to understand and resolve any areas of concern or misunderstanding,” read the statement in part.